If you’ve been online for the past few days, then the story about a fund manager that wants Steve Ballmer to go is not new to you. Otherwise, well, you just heard it. Anyway, for one reason or another we love Steve and asked few persons around the company whether or not this can actually happen. 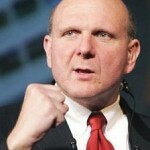 Turns out, a board of directors at Microsoft is fully behind Steve Ballmer and he is here to stay. Maybe they know something what you don’t and it’s that good.